In our last blog post, we discussed the problems and dangers of government abuse that come with mandatory minimum prison sentences for various crimes. In this blog post, we will review a recent report from the United States Sentencing Commission which discusses the effects of mandatory minimum prison sentences from a more statistical perspective. This report focuses on federal crimes and federal criminal penalties, but the mechanisms and effects of mandatory minimum prison sentences are similar in the state and federal criminal systems. In the federal system, using or possessing a firearm while committing a violent offense or certain drug offenses carries significant penalties. In 2016, defendants who were convicted of these 924(c) crimes were sentenced to more than 12 years in prison, on average. Some defendants are subject to a 15 year mandatory minimum prison sentence if they qualify under the Armed Career Criminal Act. Such defendants received just more than 15 years in prison, on average, which suggests the prosecutors were not waiving (i.e. allowing a defendant to plead guilty to a different charge that did not carry the mandatory minimum penalty) these mandatory minimum penalties very often. Defendants facing multiple counts under 924(c) received more than 27 years or 36 years, on average, depending on the number of charges. Mandatory minimum prison sentences are obviously very harsh. In the federal system, there are very few ways to get out of a mandatory minimum prison sentence if a defendant pleads guilty or is convicted at trial. One way, relevant in certain cases, is what is called the safety valve provision. Eligibility for the safety valve provision requires a defendant to qualify for several factors. One is related to the defendant’s criminal history. Any defendant who has a somewhat recent or serious criminal history is not likely to qualify for the safety valve provision. In fact, even people with more than one recent criminal conviction for minor crimes such as petit theft, possession of marijuana, DUI, etc. are likely to be disqualified from safety valve eligibility. In Florida, When a Defendant is Sentenced to Probation, Can That Probation Period Be Terminated Early? In Florida, when a defendant pleads guilty or no contest to a criminal charge or is found guilty after a trial, the judge will sentence that defendant. A sentence can involve jail or prison time or a term of probation, or both. If a person is sentenced to probation, that means the person will be under the supervision of the court, by way of a probation officer, and will likely have to complete certain requirements as part of that probation. For instance, the judge may order three years of probation and require the defendant to pay money back to the victim, complete community service hours, take certain classes, complete some type of treatment and/or certain other conditions. The expectation is that the defendant will complete those requirement before the probation term ends. If the defendant fails to complete the requirements set forth by the judge or gets arrested for a new crime on probation, the defendant will be subject to a violation of probation charge which could result in more conditions, more probation and/or incarceration. On the other hand, if the defendant does well on probation and finishes his/her conditions early, the judge might allow the defendant to get off probation early. It is always a good idea to get off probation early, if possible, for a few reasons. One, if a person gets arrested for a new charge while on probation, it is worse for that person because it gives the state much more leverage. The state would have two separate cases against the defendant, one for the new charge and another for the violation of probation. If the evidence in the new case is not very strong, perhaps not good enough to sustain a new criminal case, the state may still be able to go forward with a violation of probation since the legal standard to violate a person’s probation based on a new charge is much lower than the beyond a reasonable doubt standard for a new criminal case. Basically, if the judge (not a jury) finds it is more likely than not that the defendant committed a new crime while on probation, the judge can violate the defendant’s probation and put the defendant back in jail. Two, probation costs money and takes time. There are supervision fees and reporting requirements even after the defendant has completed the probation requirements as long as he/she is still on probation. Three, if a person received a withhold of adjudication (which means the defendant was technically not convicted of the crime under Florida law), that privilege is not vested until probation is finished and terminated. Likewise, if a person is eligible to seal his/her criminal record after a withhold of adjudication, a very helpful mechanism for people who do not want future employers and others to see the criminal record in the future, the defendant is not eligible to have his/her record sealed until probation is completed. 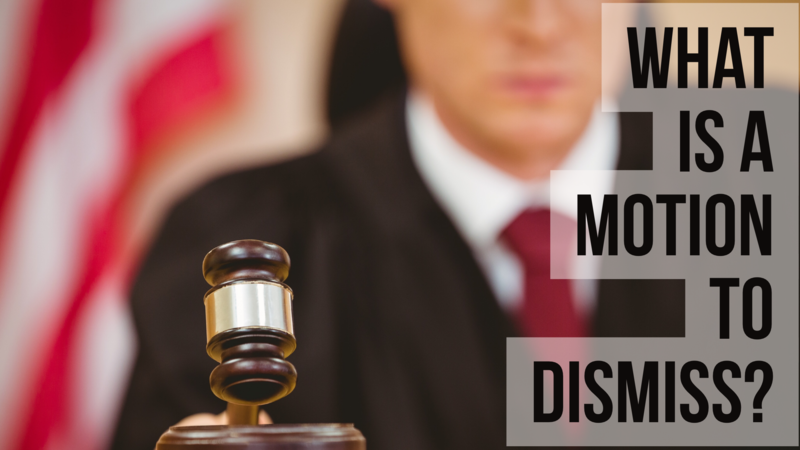 What Is A Motion To Dismiss In A Criminal Case? A Motion to Dismiss a request to a judge to throw out a count or counts against you. In Florida, there are several different types of motions to dismiss that your criminal defense lawyer can file, including motions based on being pardoned, double jeopardy, and immunity. However, the most common motion to dismiss in criminal law is commonly referred to as a C4 Motion. A C4 Motion, under Florida Rules of Criminal Procedure 3.190(c)(4), alleges that there are no material disputed facts and the undisputed facts do not establish a prima facie case of guilt against the defendant. When would a Motion to Dismiss be appropriate in my case? A C4 Motion to Dismiss is not going to be appropriate in most cases. Whenever there is any disputed facts in a case, your attorney would not file a motion to dismiss because the prosecutor would file a traverse and the judge would deny the motion without a hearing. A C4 motion is only appropriate when you and the prosecutor agree on all of the material facts, but you disagree on whether you committed a crime. For example, if you were charged with child abuse after a video of you spanking your child was discovered and disclosed to the police, the material facts would probably not be in dispute. The facts that led to the charge are on video for all to see. However, the prosecutor may allege that you committed child abuse and your criminal defense attorney may file a motion to dismiss alleging, as a matter of law, there was no crime committed. In other words, your attorney would look at the statute and the prior case law and try to convince the judge that your actions did not rise to the level of child abuse. In Florida, the process for a person getting out on bond while a criminal case is pending is usually fairly standard. If the police officer obtains an arrest warrant to arrest a suspect based on a prior crime, the judge who signs the arrest warrant will normally also place a bond amount on that warrant. After the arrest, if the defendant can make that bond, then he/she will be released pending the resolution of the case. When the police arrest someone immediately after an alleged crime was committed without an arrest warrant, that defendant will normally see a judge the next day. That judge will set a bond for the defendant then at what is called a first appearance hearing. The defendant can then be released if he/she can make the bond. The general rule is that anyone who was arrested has a right to a reasonable bond, and if he/she can make that bond, either by paying the full amount or by paying 10% or so to a bonding company, that person can be released from jail. There is an exception to this general rule that can delay or even prevent a defendant from being released on bond even if he/she can come up with the money to pay the bond. The state can file what is called a Nebbia motion to prevent a defendant from bonding out. Essentially, if the state believes, regardless of whether there is any specific evidence to support this belief, that the money to be used to pay the defendant’s bail might come from illegal sources, the state can require the defendant to show that the money comes from a legitimate source. This does not sound problematic on its face. Defendants should not be able to use funds from illegal sources as bond money. The problem is that a defendant is normally entitled to a reasonable bond at his/her first appearance hearing and should be released on that day if he/she can make a reasonable bond. If the state files the Nebbia motion, many judges will not hold a hearing on that issue at the first appearance court date. Some judges have never had such a hearing and are not comfortable conducting one when the case may ultimately go to another judge anyway. Even if a judge is prepared and willing to hold the Nebbia hearing immediately, the defendant may need some time to get evidence and witnesses to court to prove where the bail money is coming from. Judges do not hold these kinds of hearings every day. If the hearing needs to be postponed for whatever reason, it could take a couple of weeks before the defendant could have a chance to prove the legitimacy of the bond money and bond out. The bond system in Florida is already rife with injustice. Obviously, although it is much worse than most people know, it favors people with money and severely hinders poor people. All day, every day there are people who plead guilty to a criminal charge without seeing the evidence and without a meaningful consultation with a lawyer because they want to get out of jail quickly and can not afford to make a bond or wait several weeks for the next court date. The Nebbia inquiry, which the state can request on a mere hunch in all sorts of different cases, adds another questionable procedural hurdle for people to be released who are innocent until proven guilty at that stage of the proceedings. When a person enters a guilty or no contest plea or is convicted in a criminal trial, the next step is normally for the judge to sentence the defendant. A criminal sentence can involve incarceration, probation or both. If a defendant is placed on probation, he/she is placed on probation for a number of months or years. During that time, there are usually conditions the defendant must meet. For instance, the defendant may have to complete community service hours, take certain classes, complete a rehabilitation program and so on. One condition that is required among all people on probation is that he/she must not commit any new crimes. If a person violates one or more of these conditions, that person will likely be arrested and will face a violation of probation charge. There are two characteristics of a violation of probation charge in Florida that make it more difficult for defendants than regular criminal charges. One, the case is decided by the judge rather than a jury. There is no right to a jury trial for violation of probation charges. Two, the standard is much lower. For new criminal cases, the state must prove guilt beyond a reasonable doubt. There is no way to quantify this standard, but it is supposed to be a pretty high burden, at least in theory. For violations of probation, the standard is a preponderance of the evidence, which means more likely than not, or greater than 50%. This is universally considered a low standard. One intricacy that sometimes comes into play with people on probation is a situation where the probationer gets arrested on a new charge, and for whatever reason, the state does not feel like they can prove the case to a jury beyond a reasonable doubt. However, they do proceed with a violation of probation case based on that alleged crime since the standard is lower and a judge decides. This most often happens in domestic battery cases. The state may have a hard time proving the new domestic battery charge to a jury because the police often do not collect much evidence or do any investigation at the scene upon arrest and alleged victims often change their stories or refuse to cooperate. However, judges are fully aware of the difficulties in proving domestic battery cases when victims refuse to cooperate, and they know a dropped domestic battery charge does not necessarily mean the suspect is not guilty. Sometimes it does; sometimes it doesn’t. The state dropping a case and the defendant being innocent are not necessarily the same thing under the law.